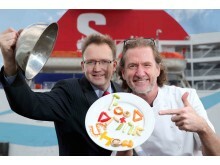 At the end of October the crème de la crème of UK and Ireland chefs will be in Belfast for the Food and Drink Show NI, taking place from Friday 25th to Sunday 27th October – and leading ferry company, Stena Line has a tasty great-value way to get you there. Top TV chefs James Martin, Scotland’s Nick Nairn and Irish favourite, Rachel Allen, plus Master Baker Paul Hollywood are just some of the names who will be cooking up a storm at the major new consumer food and drink show. The event will happen at the King’s Hall, Belfast and features the best of Northern Ireland’s food and drink producers as well as a Celebrity Chef Theatre showing not-to-be-missed cooking and baking demonstrations. 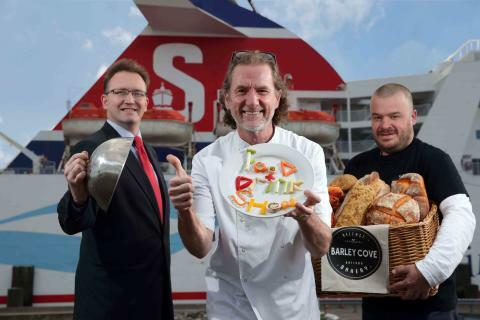 Well-known chef, Paul Rankin – currently enjoying a Big Food Trip with Scotland’s own, Nick Nairn – said: “I know Paul and James well. Of course there’s friendly rivalry between us but I’m really looking forward to welcoming them to Belfast. The Great British Bake-off and Saturday Kitchen have made major stars of them both and I know they will be a really big draw at the show. “Nick, of course, is my sparring partner on Paul and Nick’s Big Food Trip (STV) and we’ll be taking to the stage both together and separately during the event,” added Paul. For information or to book, click on www.stenaline.co.uk/ferry/day-trips/food-drink-ni, call Stena Line on 08447 70 70 70, or visit your local travel agent.